Come and spend the day making a miniature Halloween creation for your collection. 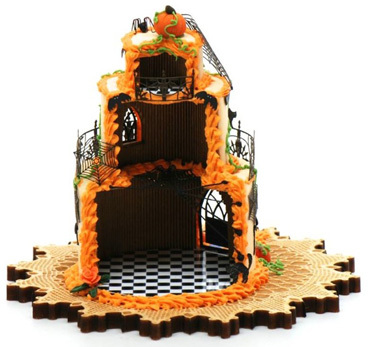 This is a 3" cake house that you will learn to fondant the outside, decorate the inside with floors and ceilings, make adorable orange pumpkins and green leaves. 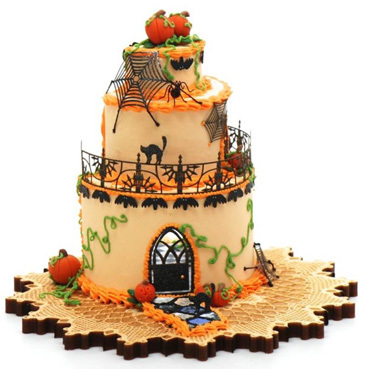 You will learn the art of frosting decorating in miniature with a special star tip and by using smaller tips make spider web runners and vines. Bats, spider webs, railings, cats and spiders are included in your kit. They are so much fun to decide where to put them! This is a class for any miniaturist, brand new or not you will learn some wonderful things! Bring tweezers and extra lighting, if you need it. Questions? Call Ruth Stewart at (406) 734-5379.